After repeated delays, the Arabic TV station al-Jazeera has announced a launch date of 15 November for its English-language news channel. US President George W Bush once allegedly threatened to bomb the Doha-based station. The channel is hoping to reach a target audience of 40 million households in Europe, Africa and Southeast Asia. 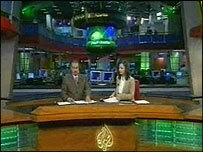 Al-Jazeera International plans a 24-hour service from bureaus in Kuala Lumpur, Doha, London and Washington DC. It is also seeking to be the first network to broadcast globally in high-definition (HDTV) format. "We are extremely proud of what al-Jazeera has achieved over the past 10 years," said Wadah Khanfar, the network's director-general, referring to the inauguration of the Arabic-language on 1 November 1996. "Al-Jazeera today is an international media organisation. Al-Jazeera English will build on the pioneering spirit of al-Jazeera and will carry our media model to the entire world. "The launching of the English channel offers the chance to reach out to a new audience that is used to hearing the name of al-Jazeera without being able to watch it or to understand its language," Mr Khanfar says. "The new channel will provide the same ground-breaking news and impartial and balanced journalism to the English-speaking world." Despite the Washington bureau, and the signing up of star names such as David Frost and Rageh Omaar, breaking into the American market has proven difficult. Commercial director Lindsey Oliver says she is confident the new channel will eventually be carried by major US cable and satellite operators, while conceding that al-Jazeera tended to inspire "very strong feelings". A recent poll found 53% of Americans opposed the launch of the channel and two-thirds of Americans thought the US government should not allow it entry to the US market. As well as 20 bureaus of its own, al-Jazeera International will also be able to call on the resources of its sister Arabic channel. But the extent to which the two channels will follow the same editorial policy is not entirely clear. Al-Jazeera International Managing Editor Nigel Parsons says the new channel will be "totally independent", although plans announced earlier this year to put the manager of the Arabic channel in charge of both channels reportedly caused disquiet among journalists at the English-language channel. Reassurances were given that the two channels would operate in a similar "spirit", although they could cover stories differently. It was reported that editors from both channels were trying to come up with a common mission statement and a code of conduct which included an agreement on the use of terms such as "martyrs", "terrorism" and "resistance". The new channel has its detractors. Palestinian journalist Khalid Amayreh recently voiced fears that it would deviate from the "policies and ideals of the mother channel". He claimed that there was a risk it could assume an international identity very similar to its main Western competitors, pointing out that al-Jazeera's English-language website relied heavily on Western news agencies.